Hotel surroundings and facilities at guesthouse prices! Delightful elegant Victorian rectory just a stroll from the famous village of Lacock, a gem of the national Trust with its Abbey, excellent restaurants and beautiful architecture. It is also the location for many films including Pride and Prejudice and Harry Potter. The Rectory is set up a drive in private grounds with free parking. 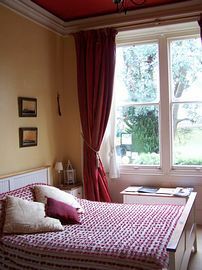 The rooms are large and have all facilities. Some have four posters. Enjoy a hearty breakfast and make Lacock a base to visits places such as Longleat, Bowood, Stonehendge, Castle Combe, Bath, Stourhead, Avebury to name but a few. London is just two hours drive. Businessmen are well catered for with wi fi access and a location just 6 miles off J17 of the M4. Fantastic house and village Great hospitality and breakfast - thank you Thanks for all your help. Lacock is a gem. Take J17 of M4 and follow A350 around Chippenham. After 6 miles at double traffic lights turn left (it says Lacock straight on ). We are first house on right.